Yesterday I had the pleasure of trying out BJ's Brewhouse Gluten-Free Menu instead of cooking! To sum it up: PIZZA!!! I loved this pizza! The crust has herbs infused in it and tastes great. It's very thin but tastes so great I actually wished it was thicker. The crust is even a little sweet. The best part is that you can get any of the pizza toppings BJ's offers (with the only exception being their meatballs), which is a pretty wide selection of toppings. Considering that the gluten-free menu seems small, the selection of toppings could provide for many varied meal options. I thought the size was just right and priced just below $10. 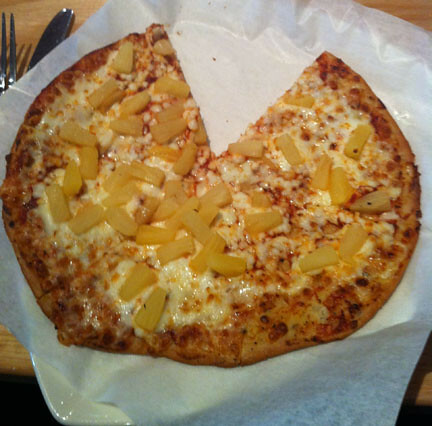 I had ordered the pizza with ham and pineapple and it came out with only pineapple. The waitress brought the ham out for the pizza and told me she had the chef do it twice because the first time he didn't do it for someone with "allergies." She waited for him to change his gloves and do it again. I was very pleased to see that the staff had been trained to understand the need for the separation of gluten-free food. If you're not in the mood for pizza, the Giant Stuffed Potatoes are also terrific as are the salads. They also offer two soups, which rarely occurs in eating out. I haven't tried those yet but plan on it for a future visit! To find a location near you, search the BJ's Brewhouse website! Enjoy eating a pizza you don't have to cook. I give it my highest recommendation for dining out!